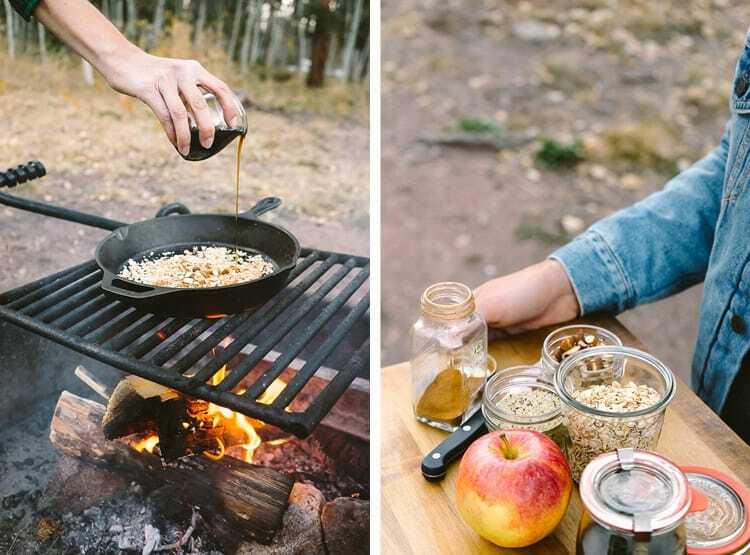 Get ready for your taste buds to fall in love these camping recipes. With bodacious breakfasts, manly main courses, delicious drinks, salacious snacks, and delectable desserts! Are you sick of eating hot dogs, but love camping? 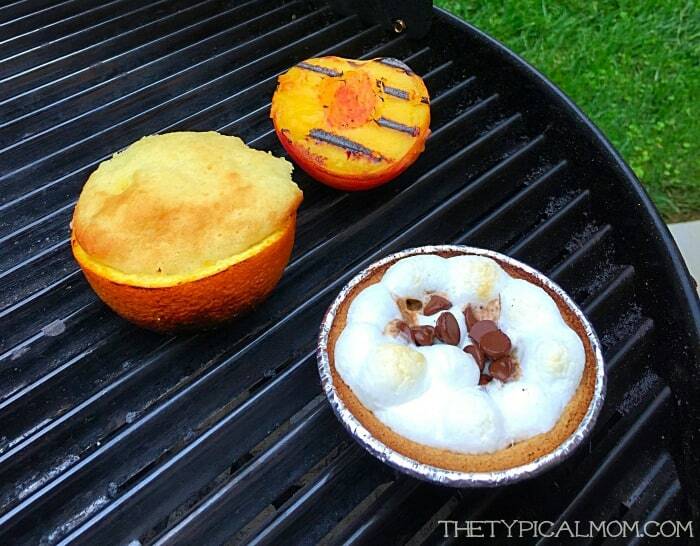 Do you want something simple to cook around the campfire, but don’t know where to start? 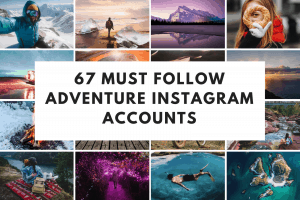 Are you looking for the most delicious, simple, and trendy meals to cook on your next adventure? If any of these describe you, you have come to the right place! I am going to take you on a tour of my much-loved list of camping recipes. My least favorite thing about camping has always been making out a menu. I have no problem packing a pb&j lunch for the trail. However, my issues are always the meals back at camp: breakfast, dinner, drinks and snacks. That is why I gathered a list of the 35 tastiest camping recipes on the web. Get Outside and Get Cookin! 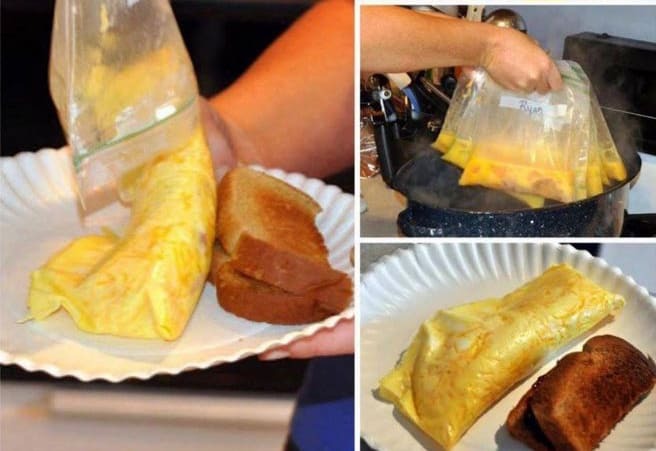 Brought to you by Beyer Beware, these no-mess omelets are fun for everyone in the family! It is extremely easy to make these on the trail or at home. Simply throw together all of the ingredients in a plastic bag and boil for about 15 minutes. We like to give our bags 7 minutes per egg. The foil packet blueberry breakfast bake is one of my favorite meals on mornings I want a slow start to my day. Pair with breakfast blend coffee and you have a semi gourmet, blueberry version of a French bread feast! 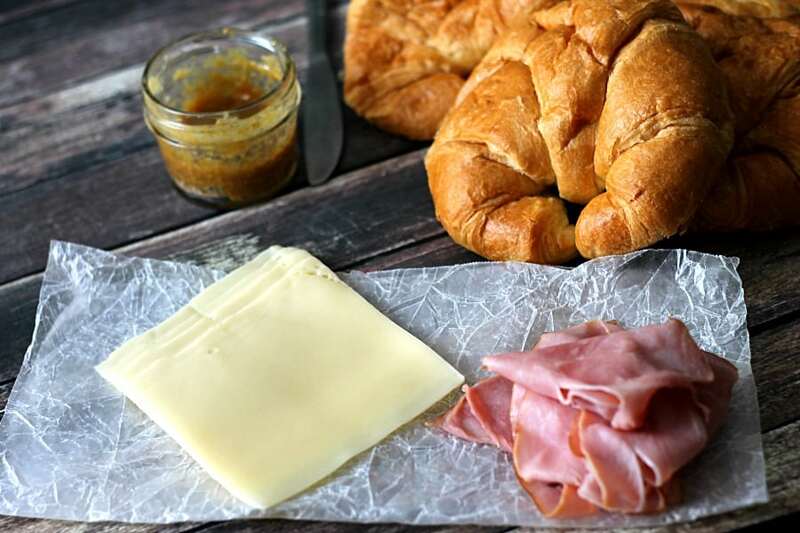 These hot ham and cheese croissants are the most delectable breakfast sandwiches for mornings around a campfire. Although the instructions tell you to bake them in the oven, wrap your croissant, ham, and cheese in foil and toss it in the flames for 5-10 minutes. 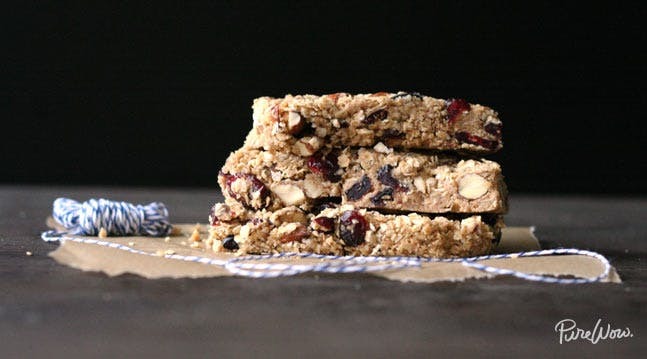 If you backpack, these home made cherry almond granola bars are calling your name! For breakfast on the go it doesn’t get easier than making some healthy granola bars at home. Using only 8 ingredients, these bars are a healthy alternative to the ones you typically see in stores. 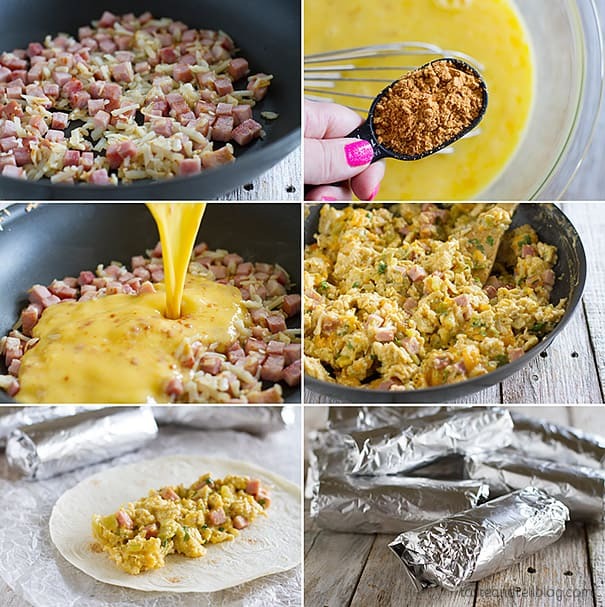 For mornings you need the extra calories, make yourself a breakfast burrito campfire style. These are another make-ahead item, so they can easily be packed in your backpack. All you have to do is make the burrito as you wish ahead of time, wrap in foil, and throw it in the fire for 5-10 minutes. 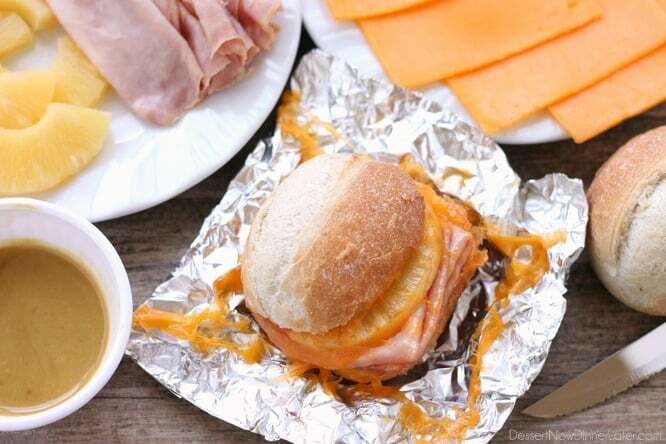 These hot ham and pineapple campfire sandwiches will have you thinking you’ve died and gone to Hawaii! This is one of the easiest recipes on the list to make ahead or at base camp. You can even pack one or two for lunch! Fairing well has a delicious recipe for a healthy, simple campfire apple crisp breakfast. 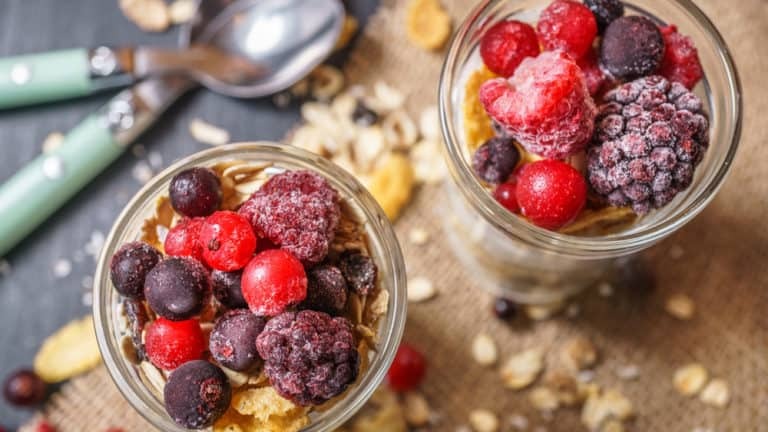 Dress up your oatmeal and make it into a dessert. For best results cook on a cast iron over a warm morning fire. Have some leftover beer and pancake mix? 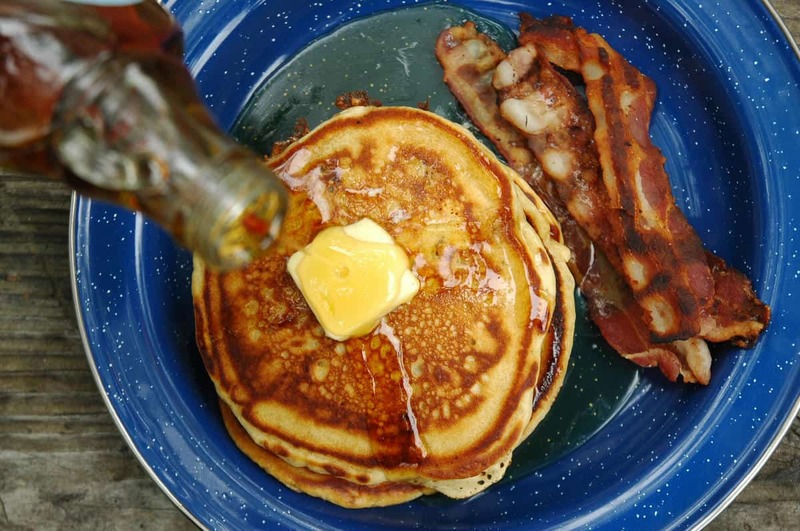 That is virtually all you need to make some hair-of-the-dog campfire beer pancakes. Chowhound does not disappoint those on a boozy adventure. Who doesn’t like warm, gooey cinnamon rolls in the morning? 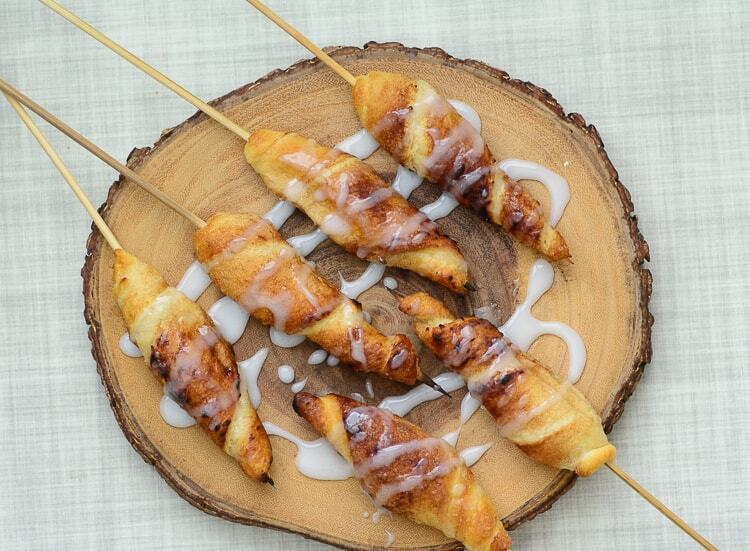 Anyone and everyone will love these campfire cinnamon roll-ups. Just be sure you bring enough skewers to share! For all my bacon fans out there, this is the ultimate breakfast dish for you! Campfire bacon is literally what it sounds like. 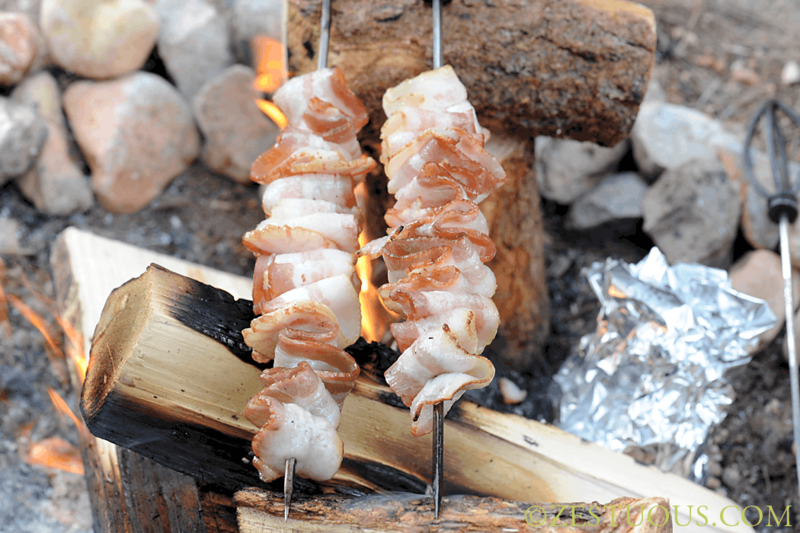 The secret lies in skewering your bacon and arranging your campfire wisely. Bacon lovers agree, bacon over a campfire does not disappoint! 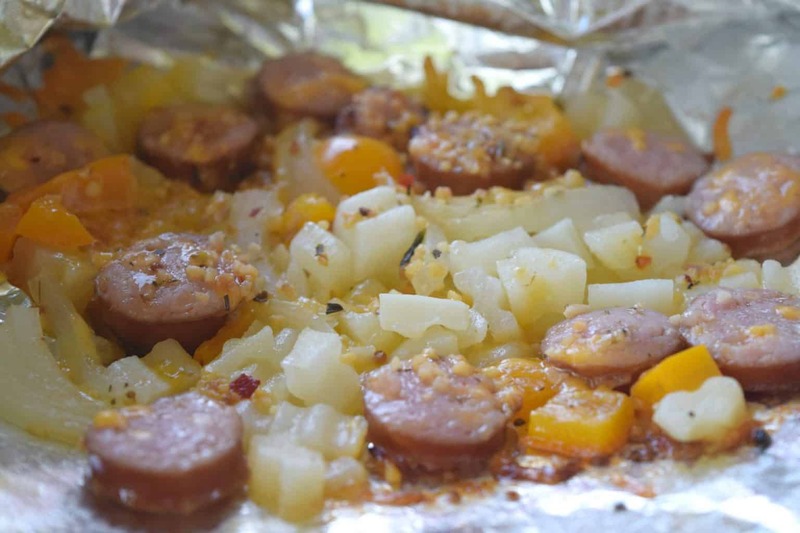 This easy tin foil sausage and veggies dinner is a staple around my evening campfire. It is made exactly as it sounds. 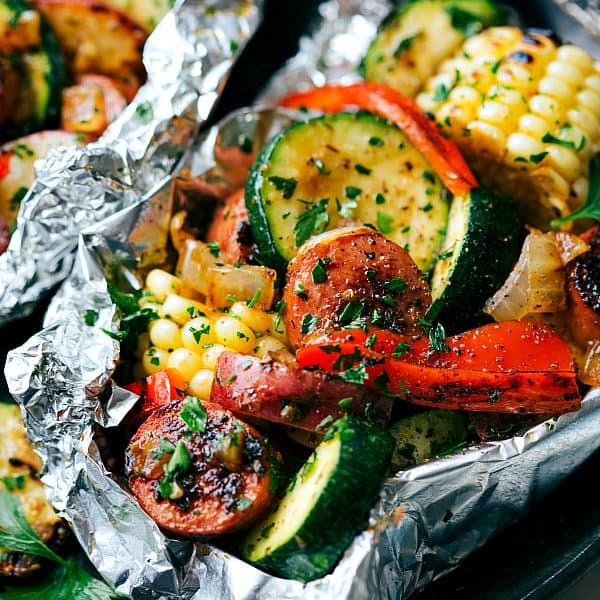 Wrap your favorite sausage with your favorite veggies, and cover it with a delicious herb mixture. Sometimes, I forget the veg and herbs and instead smother my dinner in cheese! 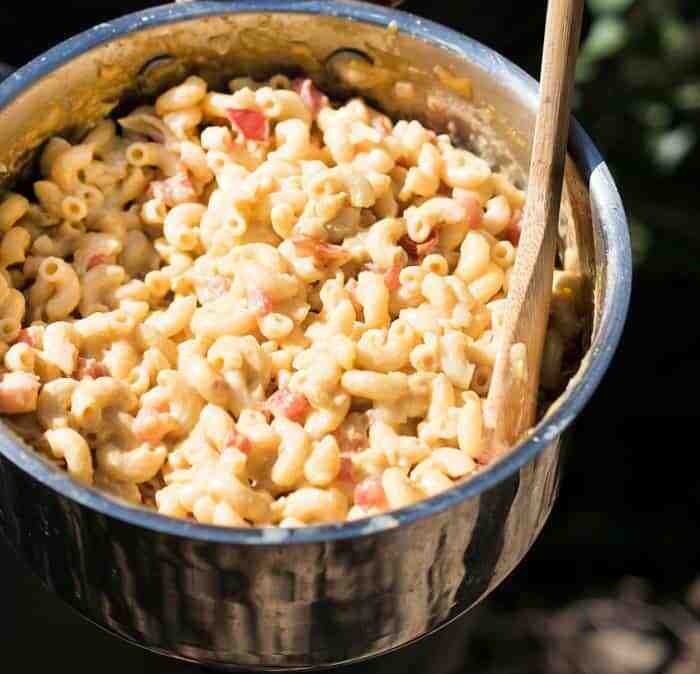 For anyone who thinks dinner around a campfire has to be healthy or boring, this recipe from Mindful Healthy Living will have you camping in no time! 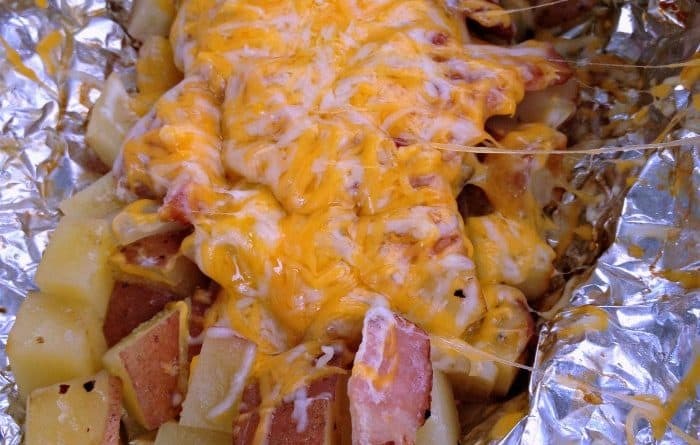 My camping buddies and I love this simple potato, cheese, bacon, and onion meal. Add more veggies and sausage to make this more of a complete supper. Some people have negative associations with the word hobo. I think only of this delicious campfire hobo dinner. When we entertain a group in the woods, I always prepare this recipe ahead of time. This is not your grandma’s chicken salad sandwich! This variation includes cheese and avocado! You can make the mixture up ahead of time, and throw in the cooler for a meal on the road or a quick dinner around the fire. This is one of my favorite meals for dinner and breakfast! Sometimes even my snack. Who could get tired of 3 cheeses, potatoes, onions, and your choice of sausage? I know I certainly can’t get enough of these cheesy potato and sausage foil packets. I know I said this list is for people that do not want hotdogs. 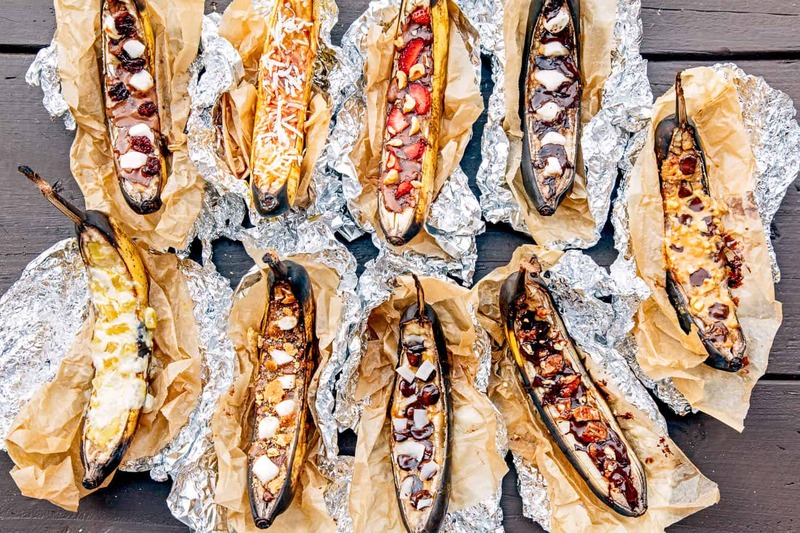 However, this is not your average camping hot dog. This dog adds such delightful condiments as bbq sauce, spicy brown mustard, and mayonnaise. 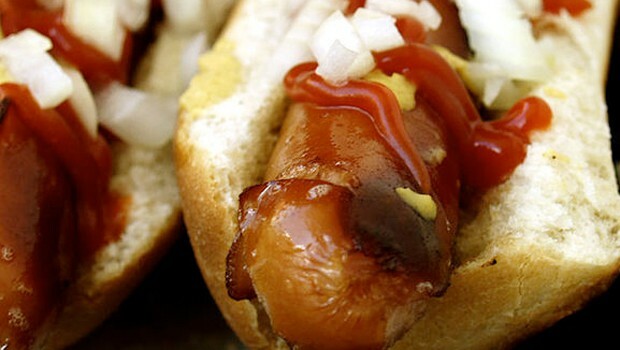 Add bacon and cheese, and you will be glad you brought hot dogs along! 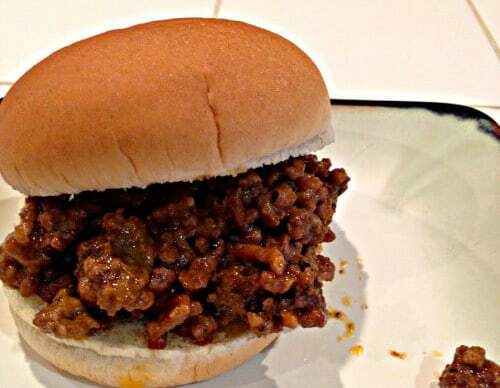 Ever decide to pass over sloppy joe night because of the time commitment? This recipe literally has 4 ingredients, so you can enjoy it at home or in front of a campfire. Besides the meat base, you only need to have ketchup, mustard, and brown sugar. 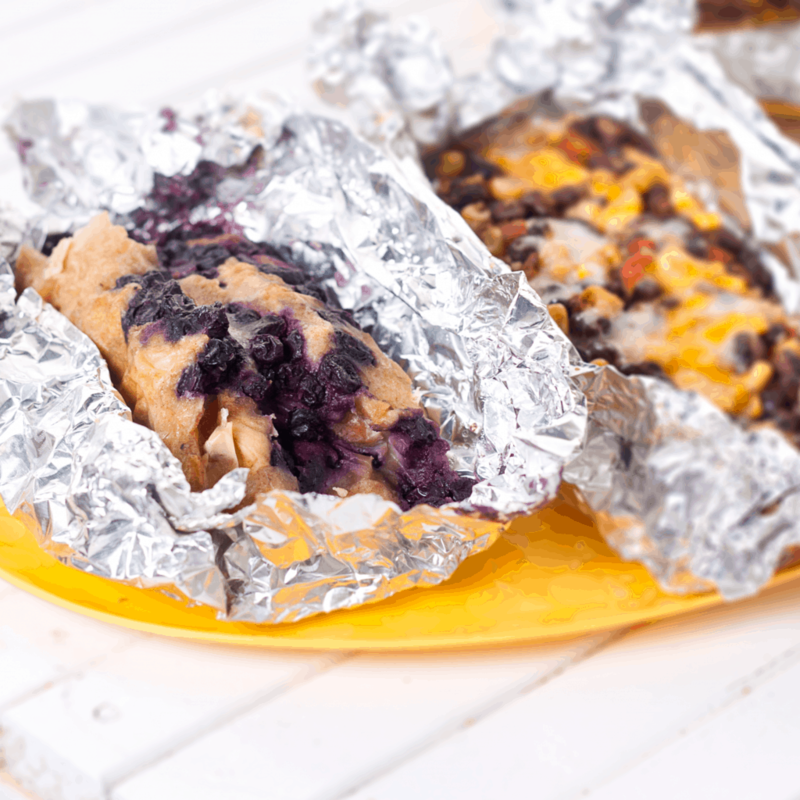 If you are used to eating ole fashioned camp beans, try this take on the classic favorite. 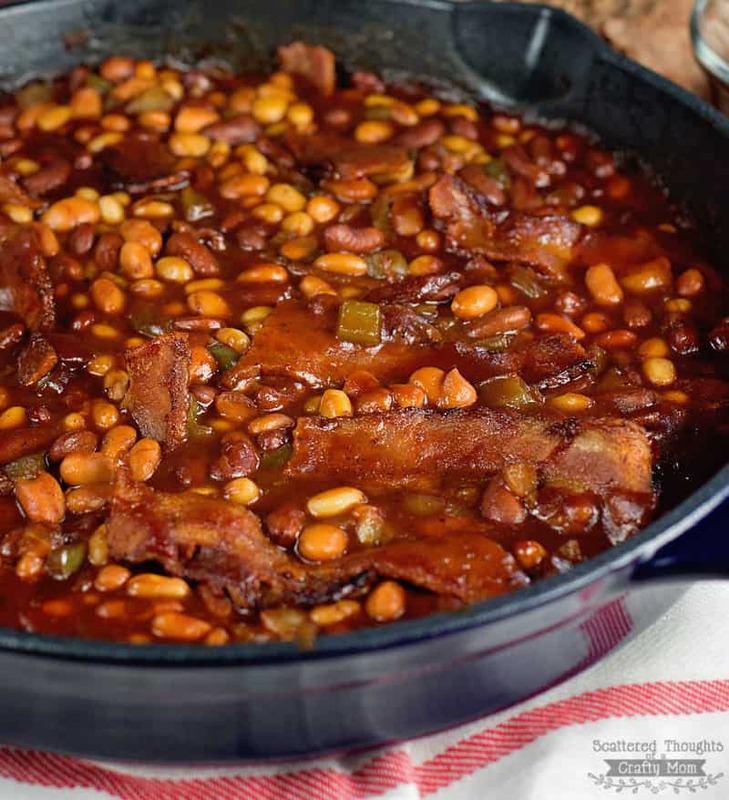 Hickory smoked bacon, 3 types of beans, and a couple veggies bring new meaning to camp beans! If you don’t like mac n’ cheese, stop reading right here and make this recipe now! Even if you are not camping, the cumin, tortilla chips, and green chilis will make you feel as though you are sitting under the stars. Either you love mushrooms or you hate mushrooms. There is no in between. If you love them, then you will love these campfire mushrooms! 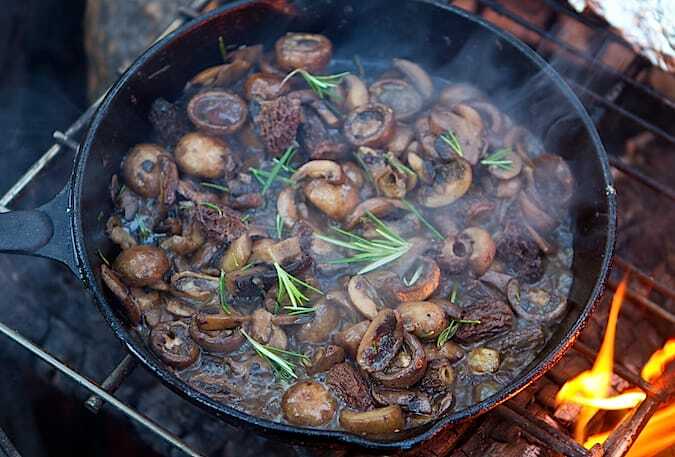 Mushrooms and herbs combine in a cast iron skillet to create a tasty gourmet experience in your mouth. 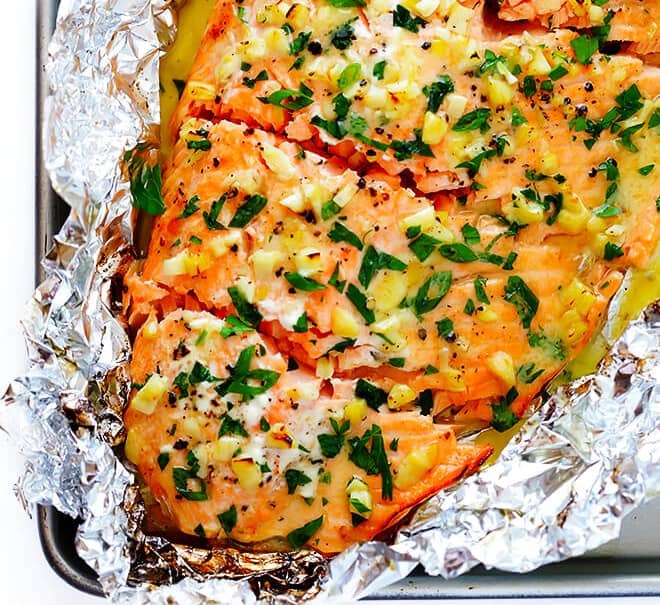 If you are a pescatarian, this garlic lovers salmon in foil is the perfect campfire dinner for you! I have been known to cook some mean salmon around the campfire for my friends, and this is their favorite fish dish! For a more complex taste, make this the night before and let it marinate in its foil packet. 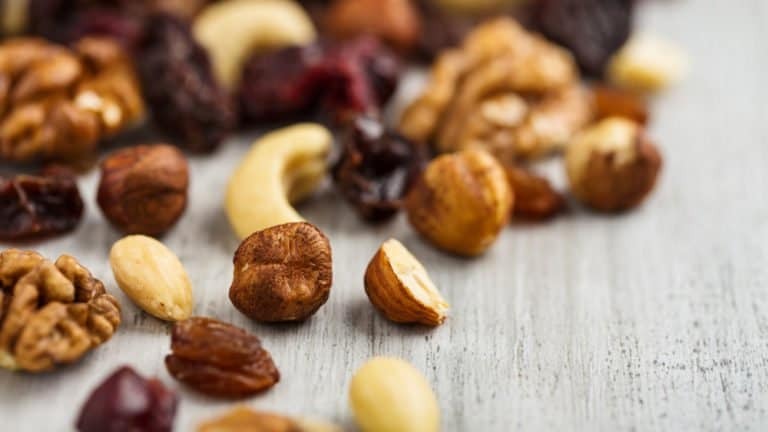 Even if you can’t find anything to like on this list, you will like this energy boosting trail mix. The toasted coconut and dark chocolate sets this mix apart from anything you can buy at the store. An added bonus: you can control how much of the good stuff you put in! 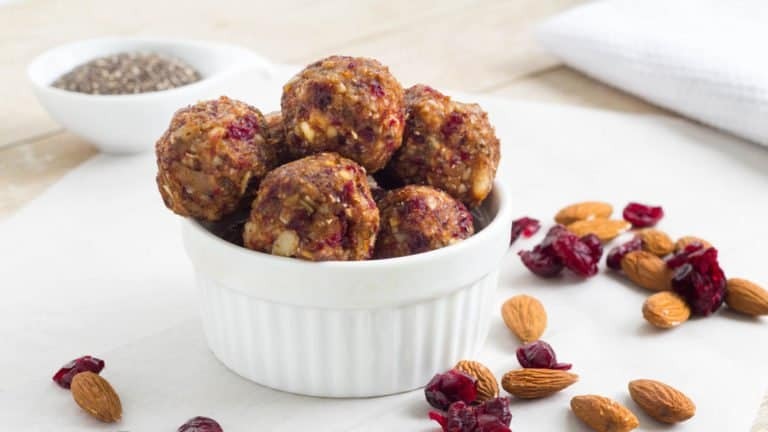 If you are backpacking and concerned about getting all the calories you can per weight, try peanut power balls. These yummy snacks provide all the goodness of a homemade granola bar with less crumbs. 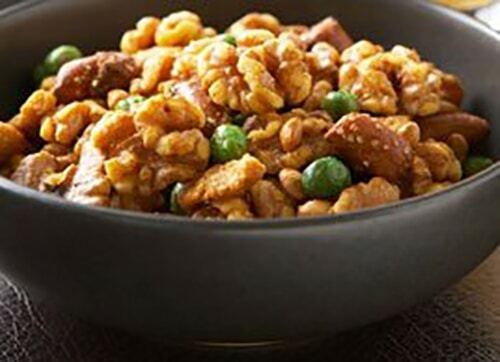 Whether or not you plan to party, this Indian Spiced Party Mix is perfect for hiking, backpacking, or around the campfire. The secret ingredients are the Indian curry paste and granulated sugar. You can stick with the ingredients in the list, but I like to add some chocolate for effect. For those times you really need to fill up on your journey, prepare this almond and chickpea power mix. This recipe from Best Health Magazine makes 14 one-quarter cup servings that pack a major punch at 171 calories! This is the healthiest granola recipe around. 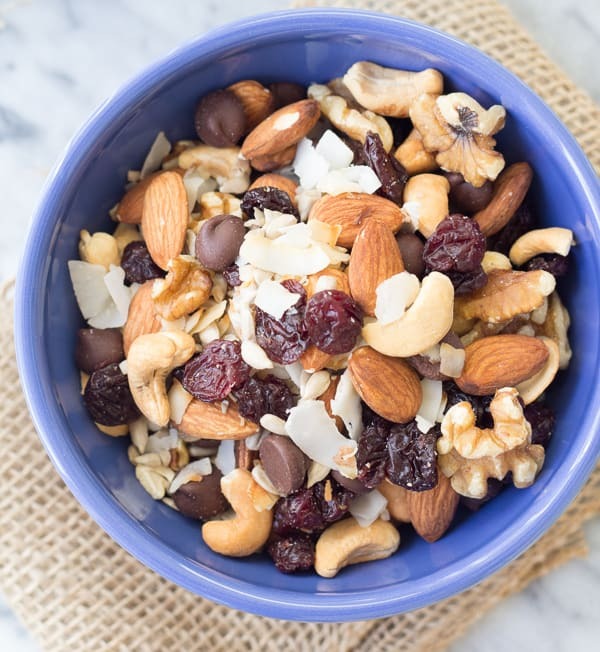 The antioxidants come from the berries, seeds, oats, and nuts. You can eat this in a peanut butter sandwich, on yogurt, alone or with warm milk. 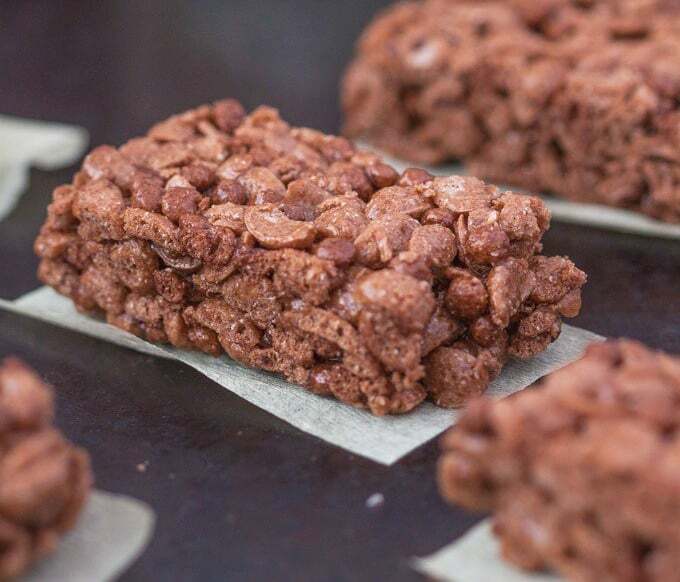 Those of you with a sweet tooth will love chocolate protein rice crispy treats. For a quick and delicious treat on the trail, this chocolate lovers 5-ingredient rice crispy treat will do the trick! One of my favorite flavors and textures included in protein bars is peanut butter. 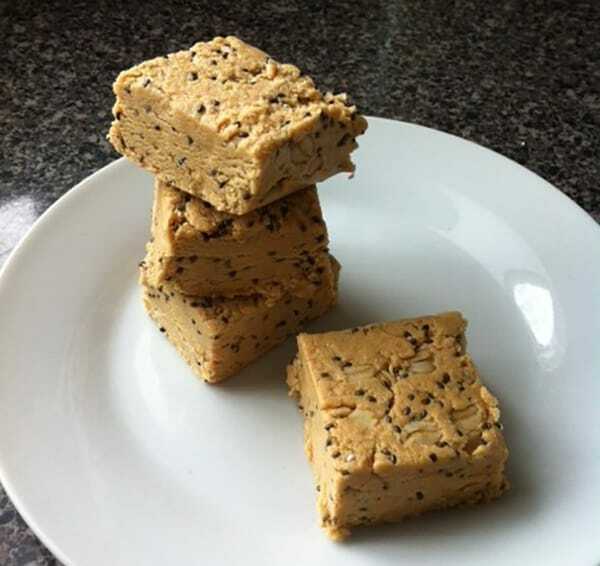 These no-bake peanut butter protein bars are a great way to get protein on and off the trail. Make ahead of time and add some dark or milk chocolate chunks. 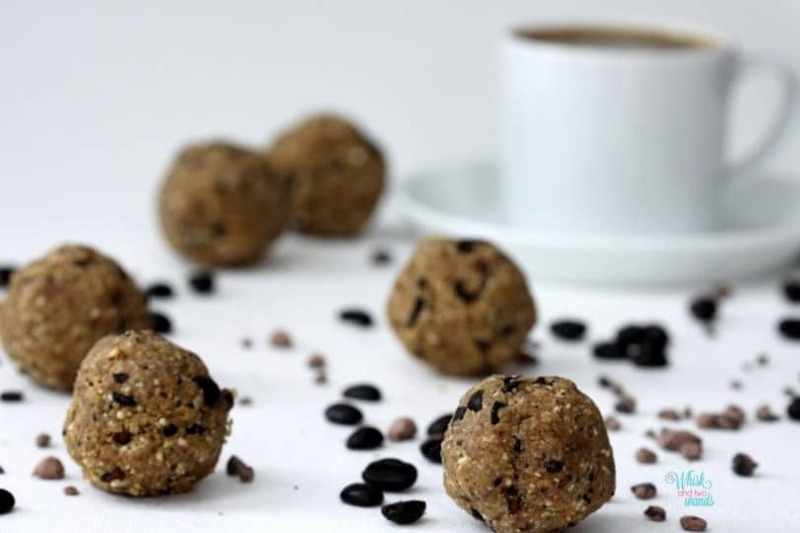 You will be thanking A Wisk and Two Wands for combining 2 scrumptious flavors in their almost infamous expresso and mocha protein power balls: espresso and mocha. 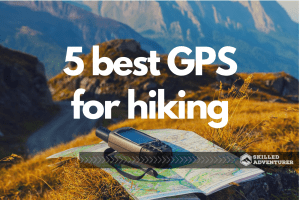 These are great to take backpacking or on long road trips. 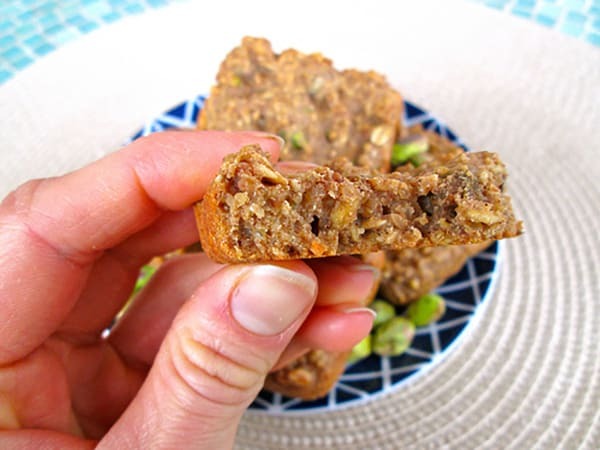 If too much protein from protein powder makes you queasy, try these nutty quinoa fuel bars. The recipe also includes ginger to calm your stomach, just in case your stomach is upset for another reason. 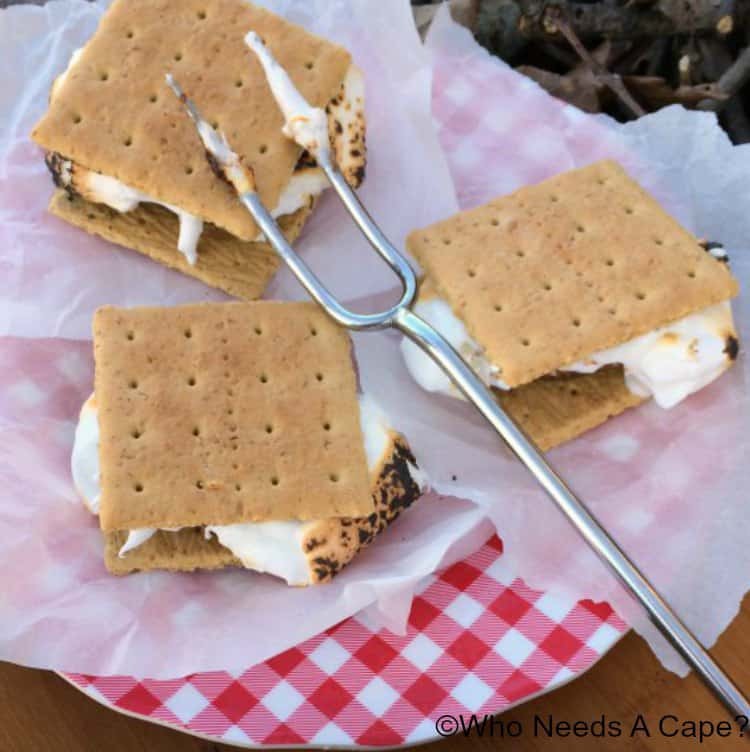 This delicious dessert can be made on the campfire or on the barbeque, so there is no need to wait until the next time you go on an adventure to try this. You will need oranges and vanilla cake mix among a few other delicious, simple ingredients. If you are in a cake kind of mood, these mini cakes cooked in orange rind are just what you need! It’s true everyone loves the classic s’mores. But is it possible to make them even more delicious? I think so, and I think these peanut butter cup s’mores prove just that! All you have to do is replace your chocolate bar with a Reece’s Peanut Butter Cup. You can make these right now in the microwave! 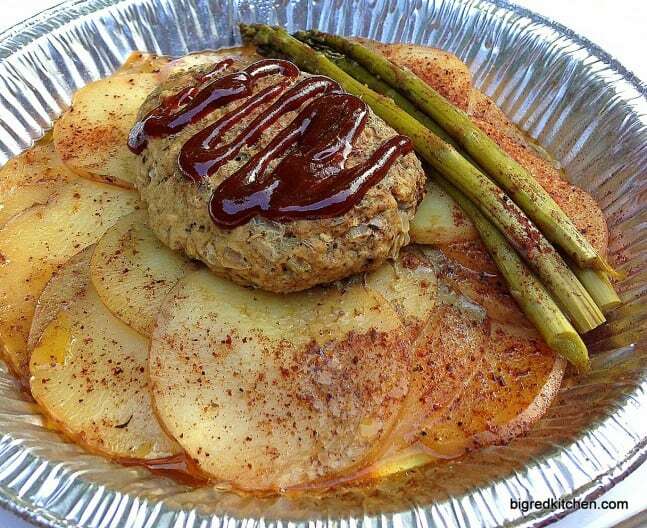 If you are trying to keep it healthy, try this recipe for baked apples on the grill. 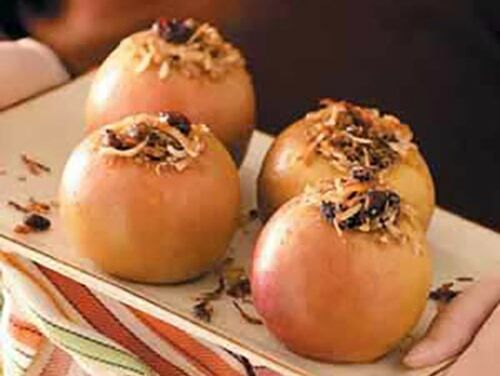 If you do not have a grate to put over the fire, you can always wrap these filled-to-the-brim apples with foil and stick them on the coals. An added bonus: there are only 5 ingredients. I love banana boats, and I don’t mean the sunscreen! This dessert is a quick, easy, and delicious camping tradition. A mix between a s’more and a banana split, these boats can be filled with whatever delightful treats you prefer. The perfect blend is a mix of melty, sweet, and crunchy toppings. 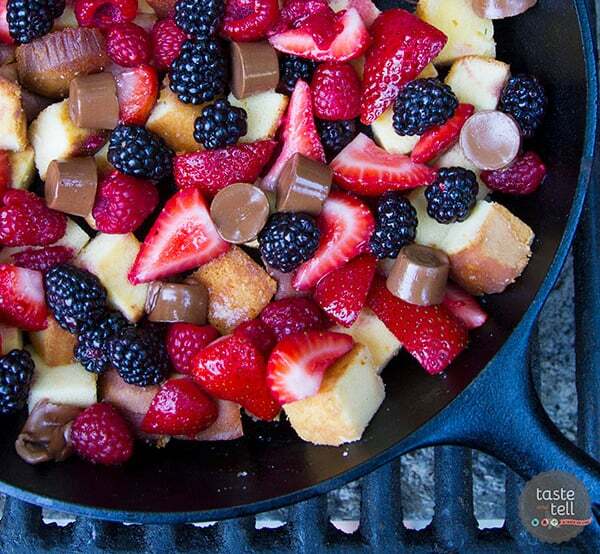 Last but not least, the cake and berry campfire skillet. I doesn’t get easier than this scrumptious twist on a summer favorite. Simply melt some apples and berries down with chocolate or caramel in a cast iron skillet. Once this mixture is complete, pour on top of the already cooked pound cake. Yum! I hope you enjoyed my list of 35 delicious camping recipes for your next adventure. These recipes have saved me from a boring camp meal more times than I can count. Trust me, your taste buds will thank you later! 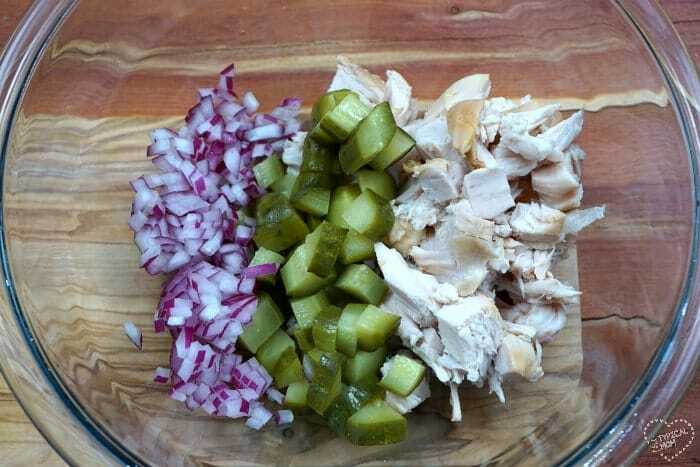 If you like my list, share it with someone who loves easy to prepare, delicious food! 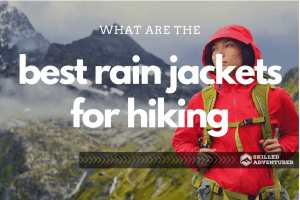 What are some of your favorite things to eat on your outdoor adventures? Have you tried any of these recipes before? What are some of your favorite outdoor food blogs?